Cat Grass – What Is Cat Grass And How Do You Grow It? Cat grass (catgrass or kitty grass) is a name used to describe several different types of grass which are popular with cats. It is completely safe for cats to eat and enjoy some non-toxic greenery. Cats lack the necessary digestive enzymes to fully digest grass, which makes them vomit the grass back up. In the process, they also bring up undigestible products such as hairballs and indigestible parts of prey such as bones and feathers. Grass contains micro-nutrients which aren’t a part of their regular carnivorous diet. Folic acid is an essential water-soluble vitamin which is responsible for several functions including metabolising fat, production of oxygen and growth and development. It acts as a laxative and can help with the passage of indigestible objects such as hair further along the digestive tract. They like the taste of it. What are the benefits of cat grass? Because cats are unable to digest cat grass, when consumed it can assist in the regurgitation of hairballs before they become a problem. 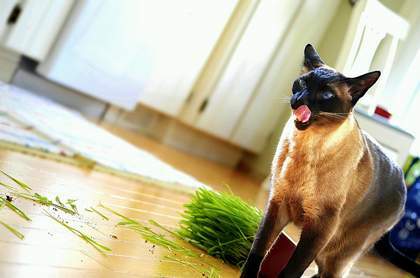 There are several types of cat grass which are safe for cats to eat. Most garden centres, hardware stores (such as Bunnings for Australian readers), and pet stores sell containers of cat grass. It is also easy to grow from seed. Cat grass can easily be grown in pots, making it an ideal snack for indoor cats. Some pet owners plant cat grass seeds in a large, shallow tray (such as the one used to grow seedlings), which not only provides the cat something to munch on but also cool greenery to lie on. Cat grass is an easy plant to grow from seed which should be available from your local garden centre. Check daily and water if the soil dries out, seeds should start sprouting within 5-7 days. Once the grass is an inch or two long, move to a spot easily accessible to your cat. Water when the soil becomes dry, but be careful not to over-water. It is also a good idea to have some growing outdoors in an enclosure if your cat has access to one. Most cats prefer to nibble on the fresh shoots, but will often lose interest once the grass matures. Do indoor cats need cat grass? No, catgrass is not essential for cats. Some enjoy it; many don’t. Is cat grass harmful if my cat eats it? Cat grass doesn’t harm your cat unless the grass has been treated with garden chemicals such as pesticides or insecticides. Is cat grass good for my cat? Cat grass may contain micronutrients which can be of benefit, it also contains fibre, which can assist with the passage of hairballs either by inducing regurgitation or by adding bulk to the stool. This depends on the number of cats as well as how much they ingest, but typically it can last several weeks to months if well cared for. Is cat grass edible for humans? Some types are, many people enjoy the nutritional benefits of wheatgrass which is consumed as a juice. Is cat grass the same as catnip? No, they are different plants. Catnip is a perennial herb which contains the essential oil nepetalactone which gets some cats high. Cat grass does not induce a high in cats. Do Cats Need A Bath?